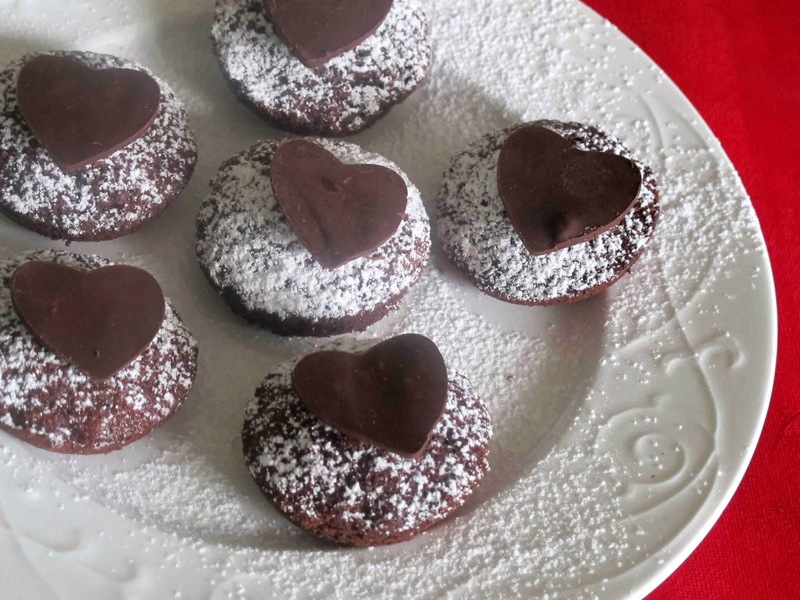 Cupcakes dusted with icing sugar and decorated with chocolate hearts make an irresistable sweet treat for Valentine's Day. I adapted the recipe from a Nigel Slater recipe for a Beetroot Chocolate Cake.The beetroot helps to keep them moist so you can make them a day or so ahead. The chocolate hearts are so easy that kids will love helping to make them. They can be used to decorate all sorts of desserts ( like a chocolate mousse, little tarts or a favourite brownie recipe. If there are any left over pass them around with a coffee. Put the beetroot in a food processor, and blend until it is a coarse puree. Melt the chocolate in a bowl over a saucepan of hot water. Don't let the bottom of the bowl touch the water. Once melted take the chocolate off the heat and pour in the hot coffee/water. Stir in the butter. This will melt in. Sieve the flour, baking powder and cocoa together in a bowl. Fold the beetroot into the chocolate mixture. Beat the eggs and brown sugar for about 5 minutes until they are creamy and thick then fold them into the chocolate mixture. Bake for about 15 minutes until a skewer inserted into the cupcakes comes out clean. Allow the cupcakes to cool before removing them from the tray. Sprinkle icing sugar over the top. Use a dab of melted chocolate to stick a chocolate heart to the the top of each cupcake. Put the tray in the fridge for a few minutes so that the chocolate hardens. Use a small heart shaped cutter to cut out the hearts.